The first example of a simple work aid is one of my most-heavily used: a simple housing jig. I describe this as my ‘poor man’s housing jig’ for reasons which will become apparent. All it consists of is a piece of 9mm or 12mm MDF to which a length of 32 x 50mm batten is glued. Dimensions are not at all critical so long as the straight edge of the MDF is long enough to span the width of the board you are housing. The dimensions of my own jig are given in the diagram. The only critical part is that the MDF and batten should make a perfectly straight 90° angle. The jig is clamped to the workpiece with quick-release clamps and used with a cutter very slightly smaller in diameter than the thickness of the board to be housed. This gives a first cut just too narrow for the board to be housed. The jig is then moved very slightly, to left or right, to widen the housing to fit the board. The jig is reserved for a particular diameter cutter and initiated by making an arbitrary cut in a piece of board, letting the cutter cut its own groove through the batten. This groove than acts as an automatic registration mark for positioning the cut and overcomes the problem of allowing for the distance from the edge of the cutter to the edge of the router base when positioning the jig. Your first cut will be extended very carefully so as not to over-widen the housing, but by the time you have made the second one your eye will be in and you will be shifting the jig just the right amount. 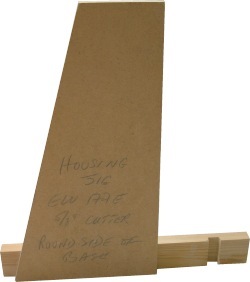 For stopped housings, a piece of MDF or batten can be taped to the jig in the appropriate position. The jig shown here is the one I use to cut housings in ‘Contiboard’, faced plywood and similar boards of about 16mm nominal thickness. I use a rather worn 5/8in cutter which gives a cut just too narrow for the board. This is the essence of the jig. It is a forlorn hope to expect to buy a cutter exactly the right width for a given board and, if you could, the next batch of board is likely to be marginally thicker or thinner. In addition, your cutter will gradually shrink as it wears and as you hone it. My approach is to make a jig and choose a cutter that nearly, but not quite, gives the right width for the board. After the initial cut, taking several passes if your router is not a powerful model, the cut is moved minutely, by eye, to widen the housing. It is no good if the amount of movement has to be measured, it must be done by eye to keep things simple. Finding a cutter of just the right size is made easier these days since straight cutters are readily available in metric as well as Imperial diameters. The other main aspect of the jig is that if you reserve it for a particular router/cutter combination and initiate it as described above, all you have to do is mark the position of the housing and use the groove in the jig to position it.